Unless you've bought a frozen lobster, what you brought home from the market is alive and kicking! So should you just put the crustacean into the large pot of boiling water? Or is that cruel? While plunging the live lobster into the pot will surely be fatal, there is some debate as to whether it is the humane way to kill a lobster. The lobster's thrashing tail making a knocking sound inside the pot, sometimes loosening the lid, can make the cook—or those nearby waiting for dinner—a bit uncomfortable. But does the lobster suffer? The jury is still out on this one. Although research indicates the lobster has no central nervous system or cerebral cortex to register stimuli, and thus the creature most likely cannot feel pain, there is still some debate. A study of crabs revealed that when given an electrical shock in a certain location, the crabs began to avoid that location, the study concluding the crabs felt the pain and therefore would stay away from the shock. But this has not convinced everyone. Whether it is believed lobsters experience pain or not, killing the lobster just before cooking is the preferred method. Perhaps this is for the benefit of the cook, as lobsters are one of the only animals we kill ourselves before eating. So maybe this humane method is really to minimize our own trauma. Or it was devised when chefs discovered that the lobster's muscles toughen with the shock of hitting the boiling water, meaning the meat will be chewier once cooked. So killing first may result in more tender meat. There are a few ways to kill a lobster before putting in the pot. First is freezing—placing the lobster in the freezer an hour before cooking will do the trick. 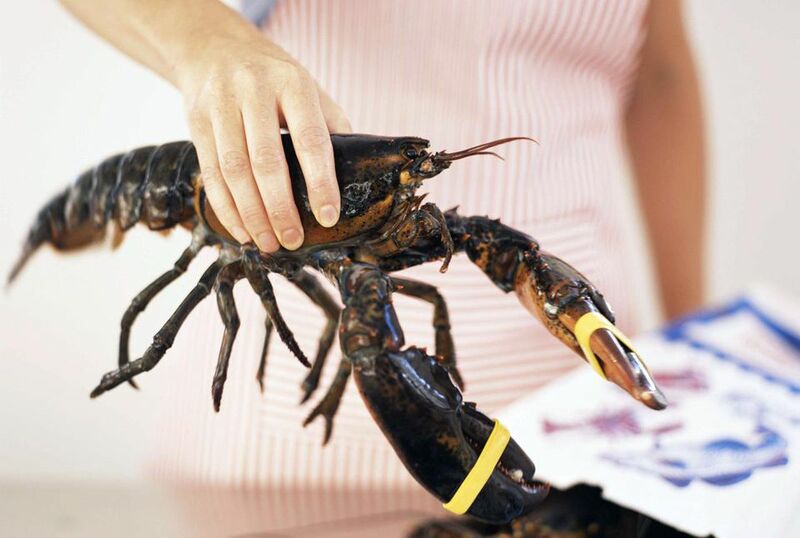 Another quicker option is to plunge the tip of a sharp knife straight down right behind the lobster's eyes. And then there are those who believe a combination of the two is best: after freezing for 30 minutes, place the lobster on its back on a cutting board. Then angle the tip of a chef's knife right below where the claws meet and swiftly cut down through the head. The legs will continue to move a bit afterward but the lobster is in fact dead. For those who do not wish to wrestle with a thrashing lobster, there is one other way. Place the lobster in a large pot in the sink. Begin filling with cold tap water and gradually increase the water temperature until it is very hot. This will desensitize the creature. Now you can use the knife to cut the cord and then put the lobster into the pot, or cut it in half for further cooking. If you don't want to go through any of these steps, put the lobster in the pot of boiling water head-first, which should kill it pretty much instantly.